Stoke Newington 1984 by Free Form Arts. Household? , Mosaic Piece & Mirror. A fading paint and mosaic cosmos in a Hackney back street. This mural was recently rediscovered when muralist Diana Leary talked about the first mural she worked on back in the early 1980s. 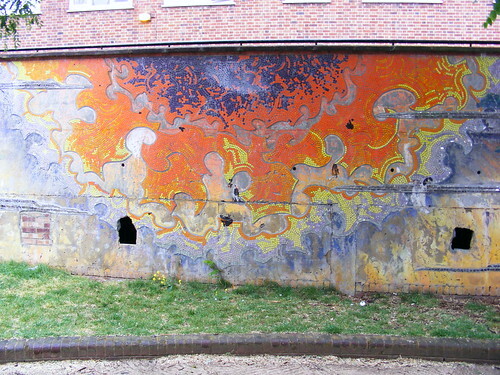 She had been involved with the Community Arts group, Free Form Arts and had helped create a mural located near Stoke Newington. By using Greenwich Mural Workshop's Murals in London Since 1976 booklet, we were able to identify the mural Diana had helped with and we went to see if it still existed. Upon visiting, it is evident that much of the mosaic work has survived. According to the booklet, there were two periods of work - 1982 and 1984. Working with residents of the estate and the children who used the Shakespeare Walk Adventure Playground, Free Form Arts used paint, mosaic, and plants growing up trellises to create scenes of stars in the night, giant planets, fiery sunsets and rainy clouds set in a landscape. (1) It is possible that the theme, morning, noon and night, related to 'Paradise Lost' by John Milton, using the name of the estate, Milton Gardens, to inspire a design. The project was funded by the Housing Investment Programme and the Arts Council of Great Britain. As much of the artwork is in good shape, it is ripe for a revamp. The mosaics are in a fairly good condition but much of the paint has vanished and there are no plants using the trellises. Catch a bus (21, 73, 236, 476, 341, 141) to Newington Green. From there, walk up Albion Road and take the first right and continue down Howard Road. Once on Howard Road, head towards the church tower at the end of the road. Take the third road on the left; this is Spenser Grove. Walk up the road and take the first left. This leads to Shakespeare Walk. On the right hand side is a closed off road into the Milton Gardens Estate. The mural is here.